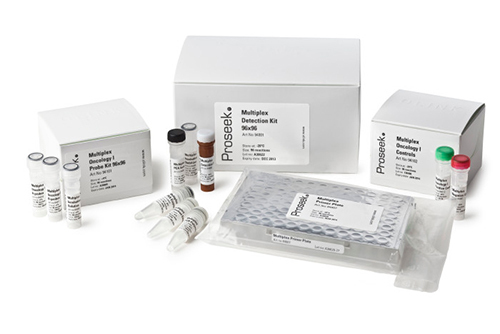 The Proseek® Multiplex Oncology II96x96 is a new human protein biomarker panel for targeted cancer research. The new biomarker panel offers high-throughput multiplex immunoassays that measure 92 cancer-related proteins across 96 samples simultaneously using only one microliter of serum, plasma, or almost any other type of biological sample, improving upon previous panels with 60 completely new oncology-focused biomarker assays. This protein panel utilizes Proximity Extension Assay (PEA) technology that uses pairs of antibodies equipped with DNA reporter molecules, which upon target binding give rise to new DNA amplicons, each ID-barcoding their respective antigens. This dual recognition, DNA-coupled method provides high-readout specificity and enables the Proseek platform to achieve a combination of high-quality data that is greatly improved over standard immunoassay techniques.